Ss will make sentences using personal pronouns. How much is the ...? How much are the ..? Part 1: Asking for the price of the school objects. 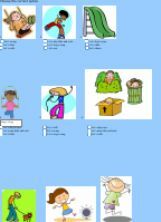 Part 2: A dialogue between the customer and the shopkeeper.Ss will complete the dialogue. 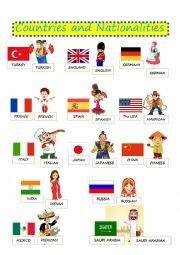 This exam paper is for 5th grade of Turkish primary schools. Countries and nationalities illustrated with traditional dressings and flags. 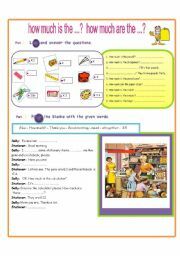 Ss will cut and paste the classroom instructions. 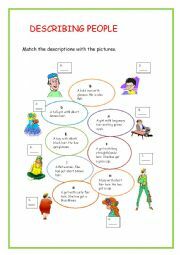 a matching exercise with pictures and descriptions. SS will answer the questions by looking at the table. 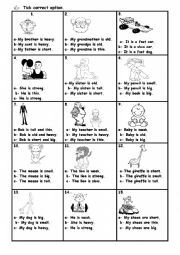 I prepared this ws for my third grade students to practise the opposites (big&small,tall&short...)Hope you like it. 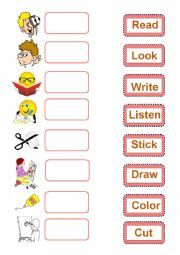 Cut and paste activity to practice greetings and meeting someone.My young learners love cutting.Have a nice lesson. Two charecters tells their likes and dislikes. 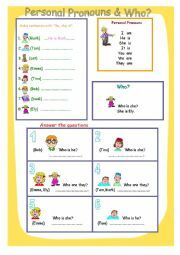 SS will rewrite the sentences with 3rd person singular form. She likes/doesn�t like...Easy and useful. 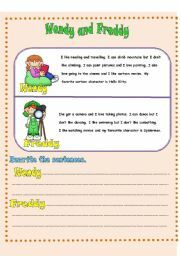 Playground action words will be practised. 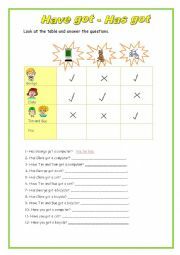 Young learners will practice a number of action verbs.